Heat oven to 350°F. Spray 2-quart casserole with cooking spray. In 2-quart saucepan, melt 3 tablespoons of the butter over medium heat. Cook onion in butter about 2 minutes, stirring occasionally, until tender. Stir in flour, salt and pepper. Cook, stirring constantly, until smooth and bubbly; remove from heat. Stir in milk. Heat to boiling, stirring constantly. Boil and stir 1 minute. Mix potatoes and ham in casserole; gently press down so surface is even. Pour sauce over potato mixture. Cut remaining 1 tablespoon butter into small pieces; sprinkle over potatoes. Cover and bake 30 minutes. Uncover and bake 1 hour to 1 hour 10 minutes longer or until potatoes are tender. Let stand 5 to 10 minutes before serving (sauce thickens as it stands). A 2-quart casserole will hold about 7 cups of filling; be sure to leave some airspace at the top so the sauce won’t overflow inside the oven. A typical 2-quart is a 9x9-inch glass baking dish, or you can use an oval ceramic baker—just pour some measured water into the pan to check the volume it will hold. Cook the onion a little longer, until it begins to brown, before adding the flour. The richer, lightly caramelized flavor will boost the overall flavor of the sauce. Add a clove or two of finely chopped garlic with the onion if you’d like. Cut the ham into small 1/2-inch chunks, that will easily layer with the potatoes. Use a mandoline slicer to achieve perfectly thin slices of potato that will cook evenly. Sprinkle the top of the casserole with finely shredded Parmesan or gruyère (like a Swiss) cheese during the last 10 minutes of baking. 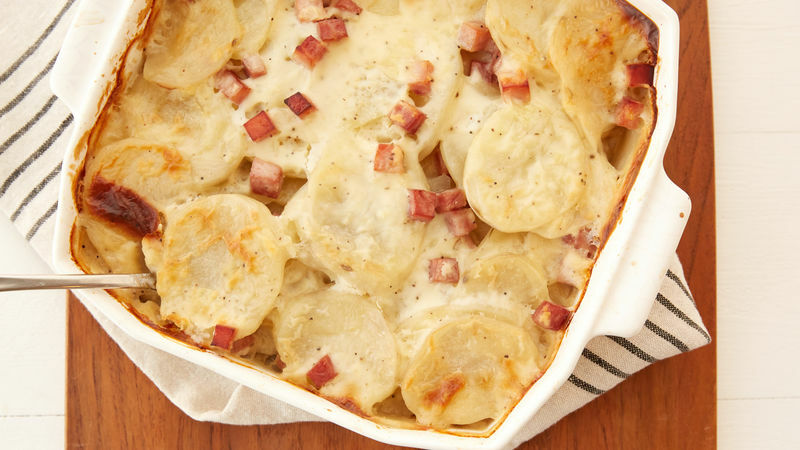 Thin slices of fresh potatoes, diced cubes of juicy ham and a rich covering layer of creamy white sauce—no wonder that this homemade scalloped potatoes and ham recipe is so many home cooks’ go-to choice when a hearty, comforting casserole is all that will do. If you’ve ever wondered about the difference between a dish like scalloped potatoes and ham and au gratin potatoes, it’s simple—traditionally, the scalloped dish has a pure white sauce, but “au gratin” calls for the addition of grated Gruyere cheese. Don’t be put off by tradition, however—feel free to embellish these easy scalloped potatoes and ham with any topping you’d like, including cheese or breadcrumbs. If you’d like to try more scalloped potatoes, you’ll find traditional favorites, easy-prep options and modern news twists in Betty’s Best Scalloped Potatoes Recipe Collection.